Lock in a great price for Tenuta Ciminata Greco – rated 9.6 by recent guests! This place is gorgeous! We only stayed one night but took advantage of the peaceful beauty and wonderful swimming pool. It’s a few minutes away from the coast and has panoramic views of the olive-covered hills and the Ionian Sea. 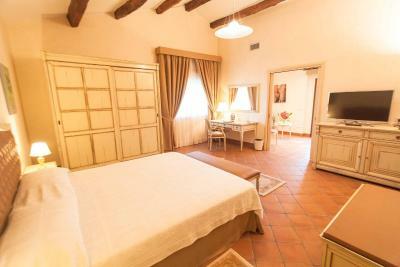 The rooms are spacious, tastefully decorated and very comfortable. Breakfast is superb. It’s close to the Amarelli licorice factory, a family-owned 300 year old licorice business. 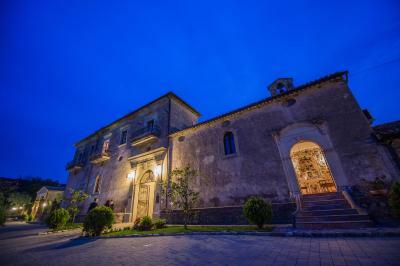 The beautiful Castello di Corigliano Calabro is a quick drive and worth the visit. The price was very reasonable for such a luxurious stay. Tenuta Ciminata Greco was one of the most amazing places we have stayed in all of our travels through Italy. The owners were friendly and helpful and as our arrival was after the lunch hour, they offered to make us a traditional selection of typical Calabrese snacks and appetizers. We sat on the terrace of the hotel enjoying our nduja, formaggio, and olives from the estate while we took in the amazing view over hectares of ancient olive trees. Our room was actually an apartment with a tiny kitchen that was stocked with a Bialetti, dishes and cookware. But the best thing about the hotel was the atmosphere of peaceful serenity in a beautifully appointed family estate. Great views, lovely staff, very friendly and helpful, good breakfast. We were recommended a restaurant that was close to the accommodation, which was superb. 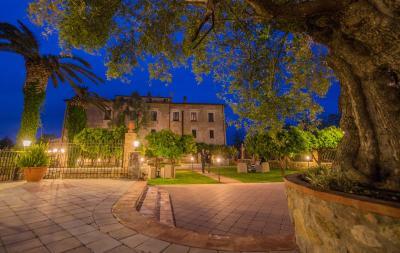 Beautifully located and renovated property surounded by century old olive trees. The room and swimming pool were good as well. Stunningly beautiful place in an equally stunning setting - an olive grove of 300 - 500 year old trees. Every aspect of this place is impeccably done. Feel like you are in a place, while paying a very reasonable price. HUGE value for your money. Great having a lovely pool to swim in amongst such a beautiful setting. Loved every moment and wish we had booked to stay longer!!! If you are looking for tranquility, this is it ! 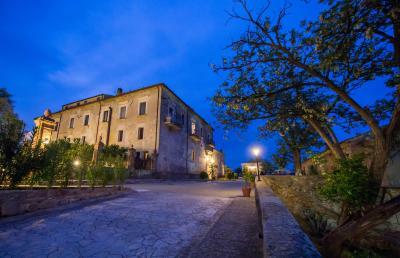 Tenuta located in beautiful place, surrounded by olive trees, with seaview at the horizon. Very special atmosphere - ideal for relax. We felt most welcomed at Tenuta Ciminata Greco. The room was nice and the swimming pool just wonderful. We will surely come back. Thank you, Mario and his colleagues! Polite & humble family owners & their friendly staff, pure calamity among very beautiful landscape and their olive fields, fine chance to taste the land with their self made products, friendly & caring for children, amazing palazzo. In total such a treat to be treated with humbleness in return. Grazie mille per tutti !!! Located in a quiet area 1.9 mi from the city center, this unique stone building is 10 minutes' drive from Lido Sant'Angelo beach. Rooms offer views of the garden or Ionian Sea. WiFi, bike rental, and parking are all free. 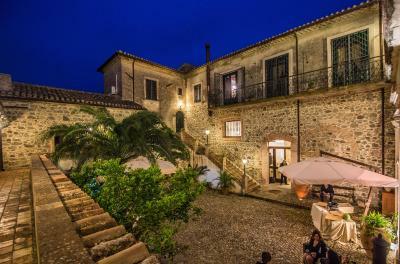 Tenuta Ciminata Greco features a well-stocked library and interesting interiors with stone arches and wood-beamed ceilings. Some room and apartment feature an original fireplace and tiled floors. All accommodations is air conditioned. Apartments also feature a kitchenette. A sweet and savory breakfast buffet is provided daily, including traditional products. Rossano Calabro Train Station is 1.9 mi away. Odissea 2000 water park is 15 minutes away by car. This property also has one of the top-rated locations in Rossano! Guests are happier about it compared to other properties in the area. This property is also rated for the best value in Rossano! Guests are getting more for their money when compared to other properties in this city. 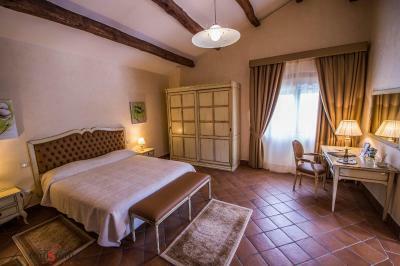 When would you like to stay at Tenuta Ciminata Greco? This room features view of the garden or sea. The mini-bar includes 1 free bottle of mineral water. This apartment features 1 bedroom and a separate living room with a sofa bed and a kitchenette. It offers view of the garden or sea. This air-conditioned studio features a fireplace and views over the garden or the sea. This studio cannot accommodate extra beds. Please specify bed preference when booking. Featuring a large furnished terrace, this air-conditioned junior suite offers a seating area, a 40" Smart LED TV and a Nespresso coffee machine. The private bathroom includes a hairdryer, slippers and free toiletries. House Rules Tenuta Ciminata Greco takes special requests – add in the next step! Tenuta Ciminata Greco accepts these cards and reserves the right to temporarily hold an amount prior to arrival. Please let Tenuta Ciminata Greco know your expected arrival time in advance. You can use the Special Requests box when booking or contact the property. Please inform Tenuta Ciminata Greco of your expected arrival time in advance. You can use the Special Requests box when booking, or contact the property directly using the contact details in your confirmation. I think I would have enjoyed the property even more if there would have been a restaurant. We would defintely have liked to have a nice italian dinner on the terrace with the amazing view. No one could complain about any aspect of this amazing place.HIGHLY RECOMMENDED! Saturday wedding party, which went on till 2 am, by the pool, with very loud music outdoor. Wifi was not great. Everything else was perfect! It was like living like royalty. 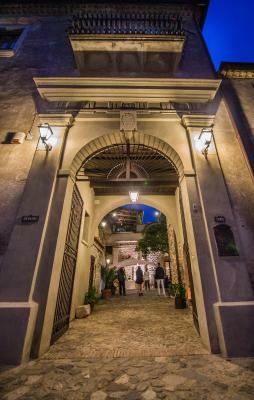 The villa has been in the family since 1700 and is beautifully maintained. The room had a lovely view over the olive groves and was extremely peaceful. Everything was exceptional including the homemade cakes at breakfast. It would be a great place for an extended stay in the summer with a lovely pool and all. The meet and greet dogs were a pleasant surprise. The old town of Rossano is very interesting and our host advised us of a fantastic restaurant, Mastro Gustino. Great licorice in the Amorreto museum. The facility is beautiful and very well renovated. Rooms are stylish and perfectly equipped. Staff is friendly and helpful. Absolutely beautiful 300 year old manor house.